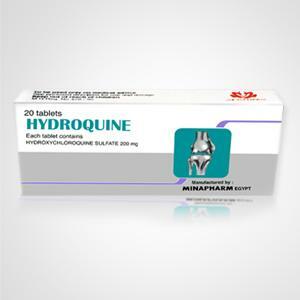 Hydroquine is antirheumatic drug used in cases of autoimmune diseases such as rheumatoid arthritis or systemic lupus, with economic price. Dose: 2 tabs/day initially followed by 1 tab/day as maintenance. Rheumatoid arthritis is an auto immune disease, affecting the joints of the body, causing inflammation and deformation of the affected joints. Arthritis may not only affect the joints, but may affect any organ of the body which is known as lupus erythmatos. Each film coated tablet contains 200mg Hydroxychloroquine sulphate. Hydroxychloroquine increases plasma digoxin level and may also be subjected to several of Known interaction to chloroquine, these include: Potenitiation of its direct blocking action at the neuromuscular junction by aminoglycosides.Inhibtion of its metabolism by cimetidine resulting in increase of its plasma levels .By virtue of its immtmomodulatory action, it reduces the antibody response to primary immunization with intradermal human diploid cell. Rabies vaccine. The use of antacids reduces its absorption and four —hour interval spacing should be considered when antacid are used. Hydroxychloroquine tablet are used only as disease modifying agent in rheumatoid arthritis, discoid and systemic lupus with delayed onset of action (more than 6weeks). Initially 400 mg are administered orally to adult and elderly in divided doses to be reduced to 200mg at maintenance; Maintenance should be achieved with the minimum effective dose that should not exceed 6.5mg /kg/day. CHILDREN: Minimal effective dose should be employed and should not exceed 6.5mg /kg/day. ADULT: A dose of 400mg every 7 days is used for prophylaxis.Wherase an initial mi dose of 800 mg is used for treatment followed after 6-8hours by 400mg and further 400mg on each of the two following days. CHILDREN: Prophylaxis with weekly doses of6.5mg/kg.Treatment should includes a loading dose of 13mg/kg followed by 6.5mg /kg 6hours later. For the two following days; a similar daily dose given. 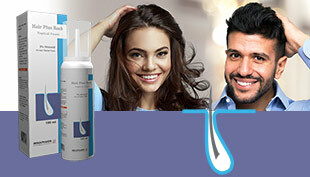 Treatment should be only given during periods of maximum exposure to light. Hydroxychloroquine 200mg is given twice weekly in patients unsuitable for phlebotomy. The use of 800mg Hydroxychloroquine preoperatively and until ambulation has shown to reduce the incidence of fatal pulmonary embolism after total hip replacement. What is the minimum age for administration of Hydroquine? Hydroquine can be given for jeuvenile arthritis starting from 2 years old. What are the initial and maintenance doses? 2 tablets daily for 4-6 weeks, followed by 1 tab/day for maintenance. Can it cause GIT disturbances? Hydroquine can cause retinopathies, but unlikely to occur with the recommended dose. Fundus examination is recomended in long term therapies every 6 months. In rare cases of proven eye affection, the drug should be discontinued.